Even this one doesn’t look right. Nobody has a brake master cylinder in stock. In fact, no one has any at all, even nationally. O’Reilly’s can send me a remanufactured one from California — but without a reservoir... That’s good because I don’t really need brake fluid for my brakes. And my faith taking the one off mine — 39 years old, you know — and slapping it on a supposed “totally works” reman is zero. This truck has had barely any problems, but when it does parts are hell to find. “OEM” exhaust flange was definitely not OEM. Aftermarket shocks were for God knows what actual vehicle. And other things I can’t recall. 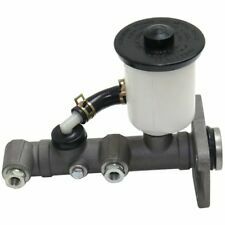 Igoogle for a brake master cylinder. Many results for ones that totalllly fit — except the image immediately shows, “Hell no it isn’t.” Including many result for ones for the updated iteration of 22R, which I had to replace on my last pickup. Yeah, not gonna work on my 20R, but nice try. There are no Coronas, Celicas, or pickups in any junkyards within 100 miles of me equipped with the 20R, so no luck there. Spring is here and I need my pickup... I also need to not die. 2019 has plagued me with many first-world inconveniences thus far.